Arizona VA Loan Limits increased to $484,350 in 2019 for single family 1 unit homes. The Arizona VA Loan Limit is also the VA Loan Limit in all non high cost Counties across the Country. 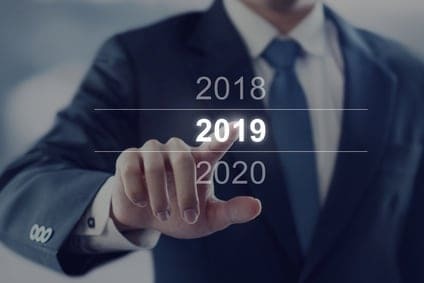 2019 VA loan amounts are effective January 1, 2019. 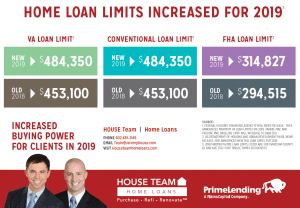 VA’s 2019 loan limit increase is due to the Federal Housing Finance Agency increasing Conforming Loan Limits for 2019. VA home loans above the VA limits are available. Learn more – VA Jumbo Loans. The most common VA Loan limit referred to is the limit for a 1 unit residential property. However, higher limits exist for 2, 3 and 4 unit residential properties. Check out the table for more on multi-unit VA Loan limits as well as special high cost are VA Loan limits. Interestingly, VA does not determine the max Arizona VA loan limit. In fact, VA has no set max loan limit. However, while VA does not set a maximum loan amount, they do set a maximum loan amount they will insure. Arizona VA Loan Limits mirror the max “Conforming Loan Limit” set by the Federal Housing Finance Agency dictates what Loan VA will insure. As a result, VA matches the FHFA’S max loan when determining the VA Loan Limit they will insure. 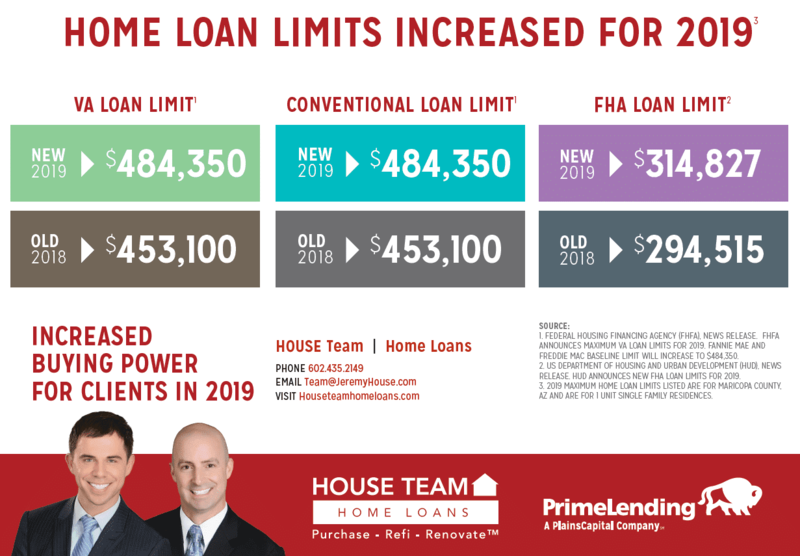 In addition, Arizona mortgage lenders set their 0% down VA loan limit at the FHFA’s max Conforming Loan Limits as well. However, VA Loans over and above the Arizona VA Loan Limit are available with a down payment. Furthermore, were a lender to extend VA loans above FHFA’s max limit would be woefully under insured position.